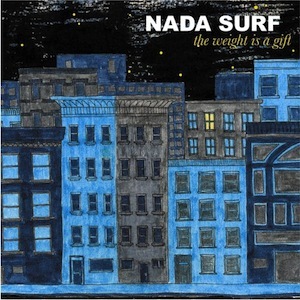 If you haven’t listened to Nada Surf since the 90s, you have missed out on one of the best under-rated guitar bands around. These guys are the best parts of the last 2 decades of pop music – a truly great blend of grunge guitar, pop hooks, and emo heart-on-your-sleeve lyrics, and just plain old optimism. Their album, The Weight A Gift, was a beautiful masterpiece; especially the song Always Love, which is a sincere gut-check, mood-lifter, and an almost constant companion of mine – on iPod, CD, Spotify, whatever. They followed it up with “if i had a hi-fi” (sic), an entire album of cover songs, breathed into new life by the band. But their newest album, The Stars Are Indifferent to Astronomy, is a revelation. There is nothing better in the world than your favorite band reminding you why you liked them to begin with. We saw them in concert last night at the 9:30 club, and the concert was a delight from start to finish. And then an unexpected bonus! – lead singer Matthew Caws came out to the merch table to meet the fans afterwards. An uncharacteristic move for a more established band, but it just seemed like further evidence of how sweet-natured they are as people, if you haven’t already learned it from their music. I was delighted! Check out what the band is up to next at the Nada Surf website.